The money the government has spent on facial recognition will be wasted as new augmented reality glasses will obscure everyone’s identity. I found this link from last year that shows the government's interests in the technology. Instead, a more intense battle will spring up over privacy. The government will try to get the exact same data from tech companies. This would be a cheaper prospective route to achieve the same goal if litigation can be minimized. Each headset will be linked to a phone number, a user account, and thus it is linked to the person. Before, money was given to companies to try to identify people by their faces. Now, the government will try to solicit the information from Silicon Valley's finest and the telcos (telephone companies). Is this a good thing? Is it bad? 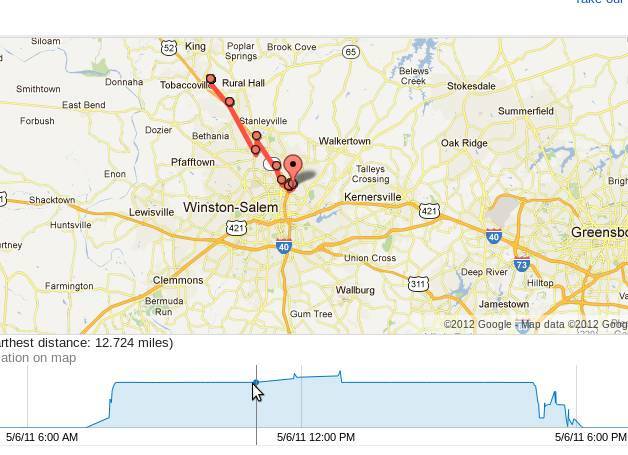 Currently, with Google location, you can turn on location history and track your travels. It tells me I have traveled over 65,000,000 meters since I started the service. The image below shows what I was doing 1 year ago. By default, this option is disabled for users. With Google glasses similar services will likely spring up. Record your entire day to a cloud server to review at a later time. Use HighlightCam to cut through all the boring footage. Or just use it to live more effectively in the present. Where was that new Thai restaurant that opened downtown? Actually pay attention to your classes and take notes later. Hell, have an app take notes for you to review later while listening to the recordings. As mobile operating systems develop the ability to readily record and store this massive amount of data, the apps will update to utilize the features to bring users more functionality, to gain greater market share, to find new ways of targeting ads and selling products. Another gray area of the ethics of many companies today is how they use your data and how long they store it. It ranges from a few months to a few years. All of this is to provide advertisers information. We, you, accept this in order to get free products; phones, apps, added functionality of apps. Saving and storing, lets say 24 hours of your life would all be part of the same package. First reactions are typically along the lines of ‘that’s evil’, ‘it’s creepy’. But then you get attacked. Chances are the attacker will get caught on the camera you are wearing. Just as police can currently call up the local telco and request the recording of phone conversations with a pass code, they will similarly be able to view the last 24 hours of your life and location history to find those clues. Parents will similarly likely track their children to ensure they use the technology responsibly. They will of course want to because the headlines of video sexting (vixting?) will be all over the news. The invasion of your privacy, or the sharing of your demographic information, depending on how you look at it, is not a new issue here. That has been the case for years. What is new is what you get for it! Because the government and companies benefit greatly by getting this information they will help pay for the glasses to help you buy them. There have already been discussions that the internet may join the ranks of indispensable human rights. The U.N. has already declared that it is a basic right in 2011 as countries continually tried to limit the content available to their denizens. Depending on the direction those debates take, the government could then be justified in passing legislation that would ensure no citizen is denied this right. It would be great political theater as one side touts the endless value added to citizens' lives and the other crucifies such policies as a new level of government intervention and invasion of privacy. No, it would not only be the government. Companies will also be peddling their goods with all the latest features. Want the latest model, $200 with contract. Wait a few months and get it free with contract. It is free, right? It is easy to veil the entire topic in a glow of George Orwell's 1984. But then again it is only an extension of the same practices that have been around for decades. Or perhaps I have already been brainwashed into loving Big Brother, not by having my head forced in a cage with a hungry rat, but rather by accepting numerous terms of service and clicking several EULAs (End User License Agreements) to receive a patchwork of tools that eventually I will not be able to get through a day without. Instead of a fear of rats, society will be incensed with a new spreading fear; nomophobia, a fear of being disconnected. Sorry if I ruined the ending for you.